Pumping up an iSUP doesn’t have to be a tedious task leaving you feeling exhausted and too tired to paddle. With the right pump and the right technique every paddler should be able to get on the water quickly and get their board to the correct pressure stress free. It’s worth taking the time to find a good pumping spot otherwise you’ll regret it later! If your pump is on uneven ground, your pump will be unstable and it will be difficult to apply more pressure when the pumping starts to get harder. Before you start pumping check that the hose and valve on your pump are firmly screwed on to ensure no air is escaping, and that your hard pumping is not going to waste. There’s nothing worse than finishing pumping up your board and then disconnecting the pump to find all the air shoots out because you forgot to check the valve position! So always check the board value is in the up (inflation) position before you start pumping. This will ensure the pump remains steady and your body is in a good pumping position. To start off with it should be fairly easy to pump air into your board, allowing you to use your arms and the full cylinder height to pump air into your board. If you don’t use the full cylinder you’re wasting energy and it will take twice as long to pump up your board. When the pumping starts to get harder you’ll need to change your body position. Straighten your arms, get your body weight over the pump & use your legs when it gets more difficult. By getting your body positioned over the pump when you push down, you can use all of your body weight instead of just your arms to do the pumping. This makes it a lot less tiring and will allow you to keep pumping for longer. When it gets harder don’t try and pump using the full cylinder height. Change your pumping technique from big (full cylinder) pumps to shorter sharper pumps. Many pumps have different pumping settings which you can alter to make pumping easier. So make sure you understand how your pump works before you start pumping. Does it have the ability to change from a big to a small cylinder when the pumping gets more difficult? Does it have the ability to pump on both the up and down pump not just the down pump? Get to know your pump… they’re not all the same! If you want your pump to do the job well then you ned to look after it. It’s always best to store your pump safely in your board bag along with your board. 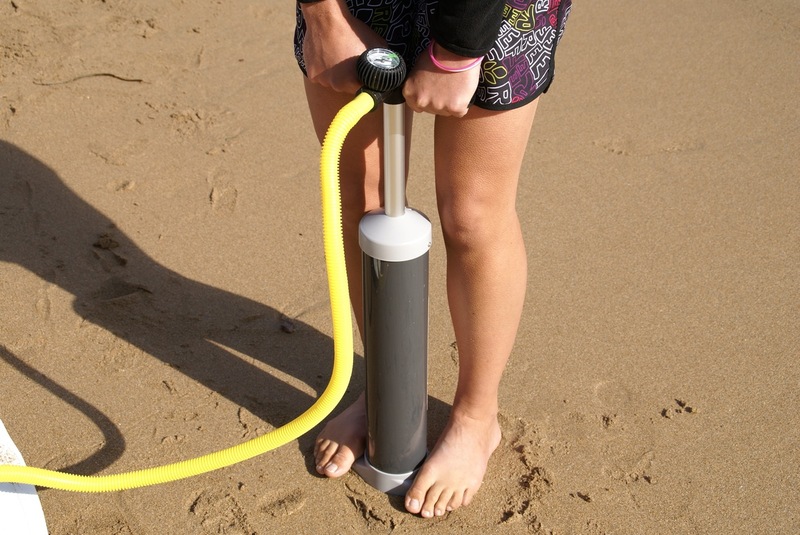 And don’t bury it under a pile of heavy stuff in the back of your van or with sand on the beach… it won’t like it! Every iSUP will come with its recommended psi. But how much air you need to put in your iSUP also depends on your weight. If you’re a lighter rider you can probably get away with putting a bit less pressure in your board, and if you’re a heavier rider you may want to add that little bit extra to ensure your board performs as well as it should. If it bends in the middle and looks like a banana when you hit the water then you’ll know you’ll need a bit more air next time! So with a bit of preparation and practice, pumping up your iSUP should be a good pre paddle warm up rather than a chore. Just remember that extra few minutes spent pumping on the land will be worth it when you get on the water! 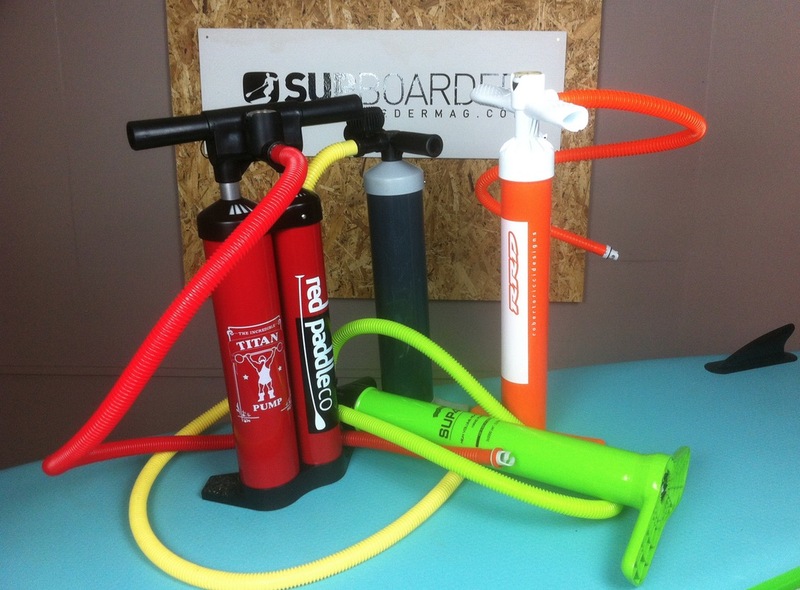 Check out the SUPboarder pump test here. Another tip: Do not pump constantly till the board is at its pressure, It’s a waste of energy. Every time you pump you are compressing air, and that compressed air it’s hot, so you will reach the recommended pressure soon, but after a while, when the inside air is colder you will find that there is no the same pressure. Better to make pauses and give a rest to the pump and your body, you don’t want to have hot air inside your board.